Now, finally you can figure out the mischief that your cat has been up to while you are gone during the day. A German engineer who lives in the US has made a Cat Cam, so you can observe your feline friends whenever you would like. He was inspired by his own cat, Mr. Lee. Mr. Lee would wander the neighborhoods day and night and his owner wondered what his cat was up to for all that time. Thus, the Cat Cam was invented. When using the Cat Cam, Mr. Lee’s owner found out that Mr. Lee has a crush on the cat next door, but Mr. Lee has competition — there is another suitor chasing after his love. Most of his day is spent meeting other cats under parked cars, exploring the plants and looking at bird feeders. The Cat Cam takes a picture every minute for 48 hours and weighs about 2.5 ounces including batteries. The price of watching your cat’s every move: $30. This entry was posted on Friday, June 8th, 2007 at 3:54 am	and is filed under Cats, National Dog, Cat & Pet Info, Products & Services for Cats & Dogs. You can follow any responses to this entry through the RSS 2.0 feed. Both comments and pings are currently closed. That thing is huge! my kitty wouldn’t have anything to do with it, let alone walk around. That is so creative and awesome! Click on the article and look through the 14 pictures that Mr. Lee (the cat) took (I guess they are screenshots of the cam). I love photography and these are definitely interesting for that reason but also to get to really see what the cat sees and does! I hope Mr. Lee’s owner creates a website.. I would definitely check in on Mr. Lee’s adventures. I think the inventor of this contraption is a sick, obsessive pervert, certainly not a friend to cats. I would NEVER do this to my cat. In addition, the box rides very close to the thyroid - stupid! Gerry - that’s pretty funny.. haha.. Anonymous - it’s a little camera.. weighs 2.5 oz.. it’s on for a few hours and i’m sure not daily.. what is so “sick, obsessive” and perverted about that? How is that “not a friend to cats”? To me it’s creative, curious and completely harmless. A little fun perspective of how cats go about their day. Really, save your energy for the real perverts and sickos out there - mainly the people in Arizona responsible for the mutilation of that dog found on the bridge. I spose you could try wearing one yourself if you fancy being tracked and viewed… to each his own. Anon - okay. I will meet you halfway here. I can understand your concern for the cat - after all, he did not choose this. But given the facts of this case and seeing the cat is just fine with the camera on (this was probably for a day or two) I don’t see how this is distressing the cat to the point where one labels the owner as ’sick’, ‘obsessive’ and ‘perverted’. Now, I would be the first to scream bloody murder at even the tiniest sign of animal abuse, trust me on this, but the vibe I get from this is completely, aboslutely, 100% harmless. If you’ve ever watched a cat die of hyperthyroid you’ might feel differently about the “vibes” this cat may be getting. Hope a bunch of people don’t think this “harmless” idea is cool. Let me know when they release the micro cam that hides on the pets collar! Soon, if not already, ( UAV/MAV) the military will have Robotic Insects with micro cams, GPS, audio, everything necessary for surveillance. don’t know what you mean. Is there actually any research that says cameras cause Hyperthyroidism? I’ve not heard of that. Studies show that Hyperthyroidism is linked to exposure to chemicals in the environment. Chemicals such as flea control products, lawn chemicals, and the lining of aluminum cat food cans. I just did some research as well because the most I heard of the causes of hyperthyroid condition was from a lack of iodine and old age. What I found still stated that as well as other reasons like environmental factors and diet. But what you linked is really news to me. I had no idea cats can get this from eating canned food. Very troubling to find that out. My cats turned 7 this year and I took them in for bloodwork and they checked for both the hyper and hypothyroidism and they were in the clear of it. But they’ve been on canned food since kittens so this does concern me. Still, I don’t see how this camera (which at most is close exposure to a battery for very infrequent length of time) should cause this much concern for Anonymous. Maybe Anon is sensitive about the location of the camera device, since he/she lost a cat from thyroid disease? I don’t think this type of cam has GPS or RFID tracking capability. That would be cause for concern, since GPS, and RFID’s emmitt radio frequencies that could cause thyroid damage. I read something awhile back, that someone came out with a cell phone for your cat! I’m sorry that Anon lost a cat and I can understand how the neck is a sensitive issue to him/her. For that reason I looked at the way the camera was put together closer. I will be the first to admit it when I am wrong and I think I assumed that this was just a keychain camera with a rigged shutter to snap a picture once every minute that the cat is out. Well, the ‘rigged’ part is a little more complicated than I thought. Turns out that he put an electric current system in there in order to preserve the AAA battery life and to make this digital (yes, it’s digital) camera work for up to 48 hours on one battery. So, Anonymous, my apologies. I assumed (and I always tell myself not to.. grrr) that this was just a harmless ‘keychain camera’. I’m sorry again about your cat. I will send an email to Mr. Lee’s owner and maker of the camera and let him know my concern of the electric current in connection to Mr. Lee’s thyroid. I would not have these around my pets neck. I know they claim cell phones don’t cause health problems in humans. However I don’t believe it, and when I do use a cell phone, I wear a headset at least. Yes, Monika, the canned food thing has been bothering me too. But I still feed my cats from pop top cans. I know from experience that an all dry food diet is an even bigger risk for other diseases. I consider that everything does have a risk of something, and when I look at the total number of things that increases the chances of Hyperthyroidism I go through it like a checklist. We don’t use lawn chemicals, all my cats have ever had one dose of flea control in their lives, and they have only one third of a can of food every day. Maybe their risk isn’t that great. If I change my approach, I could be opening them up to a risk of something else. It’s like playing whack-a-mole. Good find Monika:) Yes I agree about the electrical current/frequencies, and damage to the thyroid. It’s sometimes better not to post a flaming comment without properly explaining oneself. While I think the camera is interesting, I too was worried that it was too big. Upon reading the anonymous posting, I was immediately turned off by the tone… sometimes when instructing people on the things, it’s best to sound rational first… helps to get the point across much better. Excellent work at deciphering the possible relation to the hyperthyroid and the camera, Monika. Thank you. Anonymous was on the right track, understandably, emotions got the better of him/her and their point was made with calling people names. Not saying that’s the correct way to go (obviously, I was on the defensive there as well) but maybe that’s how it comes out sometimes when you’re angry. We’ve all been there, i’m sure. 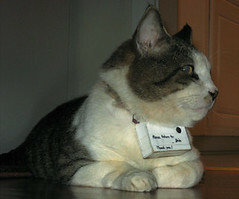 no one knows what causes hyperthyroid in humans or cats. there is no scientific proof it is pop tops or canned fish whatsoever. it is also EASILY remedied if caught early. i have 2 hyperthyropid cats and they have never been known to be involved in digital photography or electronics repair. it most certainly isn’t cause by freakin’ cameras or i’d have it after 30 years of obsessive shutter bugging. most camera batteries are minute-it’s not like hanging a power plant and assortment of high voltage wires around your cats neck. the camera battery-the button kind is indeed very dangerous if your cat ingests it. most consumer and professional cameras do not use the same technology nor power source as cell phones. my digital camera flat battery lasts several days in constant use. it also uses electric current to recharge itself within the camera-but it has to be plugged in for that . it’s fairly standard on most midlevel priced digital cameras. rechargeable batteries are also quite common in these cameras-but they are only charged while plugged in. i doubt the cat is attached to an extension cord. furthermore tests of residents near electric plants or high currant facilities shows no greater increase in hyperthyroidism. (that’s not to say they do or may not cause problems however.) if i can find one of the larger studies i will post it-one was done in in several large suburban neighborhoods. i would not however attach a largish object to my cat’s neck just because i know that do not like it.i know what they do when i am not home-nap, shed,glare at each other from their personal favorite places, watch birds and touch my stuff i do not want them to touch. So he lets the cat wander outdoors? Flamin Says: Let me know when they release the micro cam that hides on the pets collar! Yes! And then we’ll send our spies into every manufacturing facility of pet food & ingredients. I just read a good book by a holistic vet & she says most commercial pet foods have waaayyy too much iodine in them, which is most likely the leading cause of all the thyroid problems we’re seeing in pets now. Hyperthyroidism is most common in cats & hypothyroidism in dogs. wander outdoors & I bet that cam is too expensive for that to be a break-away collar! I can see that getting hung up in a second & hanging the cat. i have 2 cats and a dog. i’d put it on one of them before i go out just to see what the hell goes on when i’m not there…who throws kitty litter 18′ across the kitchen; who takes the bread off the island; who’s scratching my wool rugs; whos starting the fights. they all look so innocent when i come home…and i know they’re anything but. i think it would be quite fun! I had a camera on my late cat Micro several years ago. It was about the size of a half dollar and a nine volt battery that sent an RF signal to my computer. My cat did not care that it was hanging from his collar. Although I only kept it on him for a short time, during the time he wore it he never gave it any attention. This is not animal abuse if the beast ignores it. Just have fun with it. Elderta, I merely stated my opinon and I’m not responsible for how your mood may cause you to interpret it. I was neither flaming nor instructing. The proximity of the device to the thyroid concerned me if it emits current - as Monika found it does — just as I suspected. Thanks for checking that out, Monika. I called the inventor a name (not any of you) and I think I am entitled to post *my opinion*. Without checking it out with any of you in advance. You don’t have to like me, but I I think the idea is about as smart as adding melamine to food. There are many possible causes of hyperthyroid. Overvaccination is another. The FVRCP vaccine is being studied for connection to this and a host of other autoimmnune diseases. One poster said this is easy to treat if detected early. Unfortunately it is seldom detected early, is easily misdiagnosed and some feel current test ranges are too high to detect the problem before it is already actually advanced. The only “cure” is treatment w radioactive iodine. A very debilitating disease that compromises all organ systems. Be careful when you decide to belittle or attack someone. I’m going to get one. Each cat can wear it for a night, taking turns until I find out who is taking a dump in the bathtub every night while I am sleeping. Maybe it would be even more effective to hang the cat cam on the tub faucet.